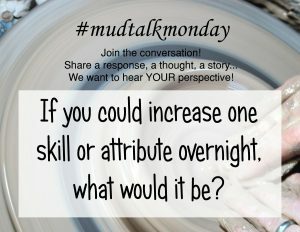 016 – Which Skill Would You Like To Increase? Hello and welcome to episode 16 of the MudTalk podcast! Thanks for listening. In this episode we’re going to hear about which skill you would like to increase the most. The original question was “If you could increase one skill or attribute overnight, what would it be?” Of course, you aren’t going to magically change yourself overnight. But what would you like to get better at? There were a lot of great answers. Even some that I wouldn’t have thought about. But there were many things mentioned that I would like to improve myself. As you can imagine, many of the responses were clay-related. So we’ll start with the clay related answers, including wedging, centering, throwing, trimming, glazing, and decorating. Then we’ll hear some more general, what I’ll call, life-skills. At the end, I’ll share some of my favorite resources that I’ve found for improving some of the skills mentioned. And remember, if you want to share your own thoughts or favorite resources, go to expertclay.com/mtp. As always, thanks for listening, subscribing, sharing and just being awesome in general. Let’s get to the responses and hear which skill you would like to increase the most. We’ll start with the clay related comments. Cyndi L A I’m with Kathy K, centering. Darkfruitbat I would love to be able to center more than ten pounds of clay, but I’m weak! Lunetca Clay related, centering. Life related, work ethic. Artofawen Throwing on the wheel. I love it, have taught it but never gotten past a certain level of expertise. And I second the life energy! Dtaylorsatm Wheelthrowing. So jealous of those plates and huge jars thrown on the wheel. Unbelievable skill. I’m just happy if i can center and create a small bowl. Oh, well…got to start somewhere. EsterLipscomb_pottery Throwing speed! I have a space quota to meet each month and I wish I was as fast as some of the other potters I work with. There is a reason my family always called me the poky puppy. Lakinkceramics Throwing on the wheel! And fully developing my ideas before making a piece. I’m working on both of them this summer! Stonecropstudio Increase my range of throwing to include new forms! Kristacford Pulling walls and handles! Mudandsticks Throwing tall cylinders @mudandsticks! Miragrl22 @bkiara88 That is my height max also!!! What is that about???? GiselleNo5ceramics @bkiara88 @miragrl22ME TOO! 😂 We should start a club. 7 Below. Barroceramicstudio Mixing my own glazes. Elmacb Being able to finish things cleanly. Andrea G If telepathy and flying can’t be included, then I’d have to say sculpting. Tarihuffaker Consistency and self-expression, both in life and clay. There were a number of people that responded with skills that weren’t related to clay. Since they can be applied to many different things I’m going to think of these as life skills. Olisny Networking. So many other potters with knowledge out there, and I’m too shy and lack confidence in my own skills to reach out. Forgottenfern Social networking. How to get my work seen by people who like, admire, and want to buy it. Claybylaura appreciation — learning to value what is. Giselleno5ceramics Thinking before I react. Tweeter_williams Business savy. I don’t want to take away from the ups and downs of learning and exploring new things – figuring it all out for myself. However, my business mind struggles and needs improvement. Allisonqpottery11 Marketing/confidence. I have hard time believing in myself or thinking my pieces are good enough to sell. I get compliments from family and friends all the time and badgering to sell but it’s hard to change that mindset. 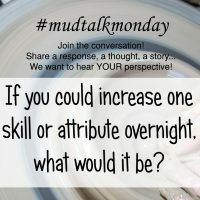 Thanks to everyone who shared their thoughts on the MudTalk Monday posts on instagram and facebook. As for my own thoughts… Boy, I’m not sure if I could pick just one. I would like to try some more complex forms on the wheel, get better at making lids and spouts, and maybe explore assembling multiple pieces to make a pot. I would also like to improve my online presence and marketing, get better at networking, make more money, and help other people learn about pottery and improve their skills. And then there are some other things like running a faster 5K, learn more songs on the guitar, and do more digital illustration. But if I had to pick just one thing… I’ll have to go with self discipline to cover almost all of those things. Now, you may ask, how do I plan to get better at something like that? And I guess I would say that it goes back to Episode 3 about setting goals. Not just any old goal, but a SMART goal. Looking back at the show notes for that episode, found at expertclay.com, I can see that first, I need to specifically define what I want. So, overall, self discipline is pretty abstract and hard to measure. Maybe time management is closer to the skill that I want to improve. So to be specific, I’ll say that I want to get things done in a more systematic way and finish things at a more constant rate. Okay, now I need to break it down and focus on one thing at a time. It could be a new article every month or a certain number of hours in the pottery studio. But to really make this interesting I’m going to put out two MudTalk podcasts per month until the end of 2018. That is specific, measurable, attainable, relevant, and time sensitive. So next, I would set up my plan. I won’t bore you with the details of that but basically I’ll set my publish dates as the 1st and 15th of each month and then work backward to set up a schedule to keep me on track through the month. Now the cool part about this is that all of you listeners have heard my goal. So if it is a week past the publish date and you don’t see a new podcast, feel free to send me angry emails to keep me accountable. But enough about me. Let’s talk about some resources that will help you improve some of the skills that were mentioned in the comments. I’m working on an article on the Expert Clay blog with some tips for throwing taller pots. For centering large amounts of clay I’ve centered 4 or 5 pounds first, then put 4 or 5 more pounds on top of that and center the new ball of clay. Keep going until you have a large enough amount centered. Some of my favorite glaze books include Mastering Cone 6 Glazes by Ron Roy and John Hesselberth, John Britt’s Guide to High Fire Glazes and Guide to Mid Range Glazes, and Robin Hopper’s Ceramic Spectrum. There are an abundance of books and videos about throwing. I really like Ben Carter’s book Mastering the Potter’s Wheel. As for handles, I used to hate making handles. Then I made a bunch of handles and got a little better. Then I went the the Handle With Care Workshop and learned some great handle and decorating techniques from Todd Pletcher, Eric Botbyl, and Matt Schiemann. I wrote a blog post about the experience and I’ll have a link in the show notes. As for the life skills, things like energy, discipline and focus, I’ve read or listened to a plenty of books and some of my favorites off the top of my head are High Performance Habits by Brendon Burchard, Start with Why by Simon Sinek, Steal Like an Artist by Austin Kleon and anything by Seth Godin for marketing. I’ll have links in the show notes to all of the resources mentioned here. What I’ve found to be the best resource for networking is simply showing up. If there are pottery or art related events in your area, show up. If there are festivals or shows where another potter is displaying work, show up. Tell them you like something about their work and ask them a question. If you follow potters or groups of potters online show up in the comments. Let them know that you like something. One of my favorite overall resources is attending workshops. Not only do you get to learn from other potters in person and ask questions but it is a great opportunity for networking. All the other attendees are most likely potters and some workshops attract people from all over the country or even the world. And I’ve found that the learning isn’t always focused on one specific technique. Presenters and even other attendees will also discuss selling, marketing and some of the life skills that have been mentioned already. So if you have a chance, I would recommend attending as many workshops as you can. As you know, there are many other kinds of resources out there. I’m sure you have some favorites as well. If you want to share, go to expertclay.com/mtp to send a note. There’s really no other substitute for practicing most things. Putting in the time and working at it consistently. So, as we wrap up this episode, I hope you have already improved some skills since you left the comments. In our next episode we’ll have one of my favorite questions: What do you do that has been the biggest contributor to your success? Until then, keep improving your skills and stay muddy.